Includes a Center Column Hook for Hanging Additional Accessories, or to Add Weight to the Tripod for Additional Stabilization. Flip-Locks for Leg Height Adjustment; Telescopic Pan Handle; Rubber Feet with Enclosed Spikes; Center Locking Brace and Geared Elevator Center Column; A Carrying Bag & Gift Box is Included. The pan and tilt head facilitates smooth camera positioning and precise alignment. a hook on the bottom of the center column for hanging additional accessories, or to add weight to the tripod for additional stabilization. The flip-locks quickly secure the telescoping tripod legs, while the center brace adds stability by connecting the legs to make them more rigid. The geared elevator rapid center column allows quick and easy camera height adjustment. The quick release plate is the swiftest way to mount and align your camera to the tripod head. Rubber feet provide maximum traction on all surfaces. 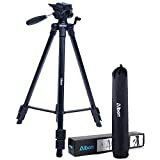 This entry was posted in Discount Photography and tagged Albott®, Aluminum, Camcorder, Camera, Carry, Lightweight, Travel, Tripod by Ball Photo. Bookmark the permalink.